"It is a fascinating and provocative thought that a body of water deserves to be considered as an organism in its own right." Penultimate day of flash of red......nearly there! Colour looms again soon, but I have to say I have so enjoyed toying with monochrome, I shall be wanting to do more of it. This fountain is by a hospital. The statue of the heron was situated in such a position that he was only visible through one break in the surrounding bushes from the main path, so I am not overkeen on his angle, but I loved the light play on the water. Oh, yes, the light on the water is amazing. Nicely captured. Beautiful capture. Love the sparkly dancing water. Glad the heron is only a statue, it looks as though the tsunami is coming. This is great, Casablanca. I really like it. I love the sparkly water, too. Like your capture of that fountain and the sparkling water! 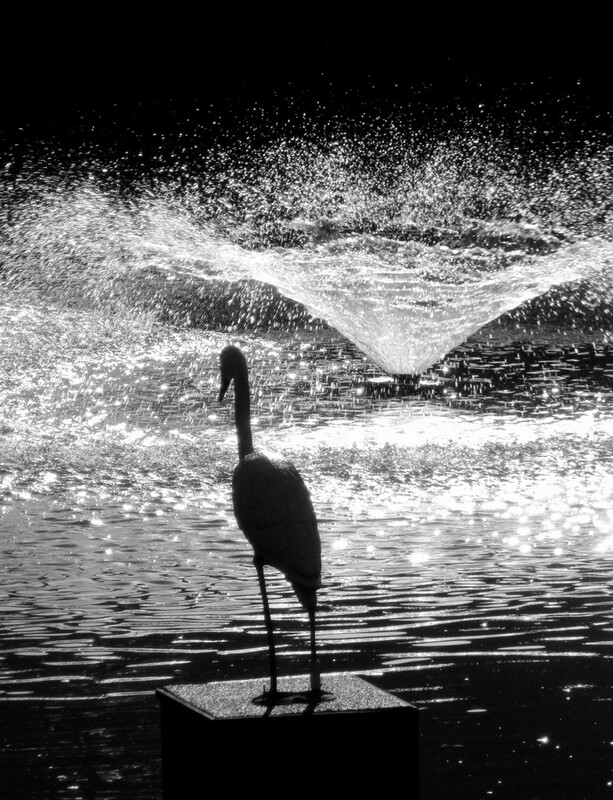 Great lighting - at first I didn't see the fountain and thought it really was a bird with the waves coming in. Beautiful light and wonderful water! Great image! I rather like monochrome and this is even more effective viewed on black. Super how you managed to capture the drops and all... love it..
Love this on black - great for a b&w shot. Fab for the contrast theme in FOR Casa, love the silhouette against that water. Great light and water spray!